SwankMama: father's day gift ideas for the fit dad + a giveaway! father's day gift ideas for the fit dad + a giveaway! Father's Day is just around the corner and writing this post has got me thinking that I have no idea what to get hubby or my dad. Growing up, I remember my mother would always say that Dad needed more underwear and socks. Really? I mean, how boring would it be to open up a package of underwear or socks for Father's Day? And Christmas. AND your birthday!! Every year, I love the encourage the kids to create a handmade gift for hubby. Now that the younger ones are older, they're able to contribute a lot more and help Sasha brainstorm about what to make Daddy for his special day. However, I believe hubby (and dad!) deserve to be spoiled once in a while. You can only have so many socks and underwear - am I not right?! Since I'm on a mission to get the entire family on track with their fitness (it's a work in progress! 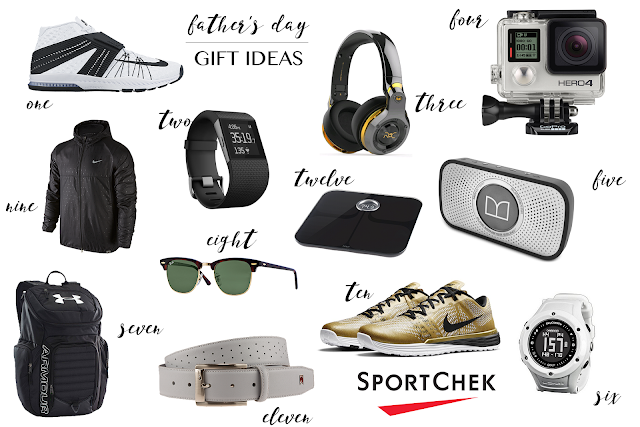 ), it couldn't be more perfect than to make a Father's Day wishlist from Sport Chek. I dug a little deeper and uncovered some pretty amazing products that are available at Sport Chek (online and at your local store) and guaranteed to bring a smile to dad's face! Just in time for Father's Day, Sport Chek is generously offering one of our Canadian readers a chance to win a $100 gift card! To enter, please follow the instructions on the Rafflecopter form below. This giveaway is open to Canadian residents only and ends on Tuesday, June 14, 2016 at 9pm PST.